In Florida, the effects of climate change are easy to spot: The increase of “sunny-day” flooding in coastal cities like Miami, the bleaching of coral reefs off the coast as ocean temperatures rise, the recent hesitancy of homebuyers to purchase houses too close to the water. But under current Governor Rick Scott, the state has been known more for its attempts to avoid talking about climate change than its actions to address it. Next fall, that could change. With Scott facing a term limit, Florida has the chance to elect a governor who makes addressing the impacts of climate change a priority. And already, environmentally-conscious voters in the state have a few options. Andrew Gillum, for instance, the current mayor of Tallahassee and Democratic candidate for governor, has made climate change a key part of his campaign. “Frankly, it’s foolhardy for any leader of the state not to aggressively address the issue of global climate change and sea level rise,” Gillum said. Gillum is right about Florida’s vulnerability to sea level rise. 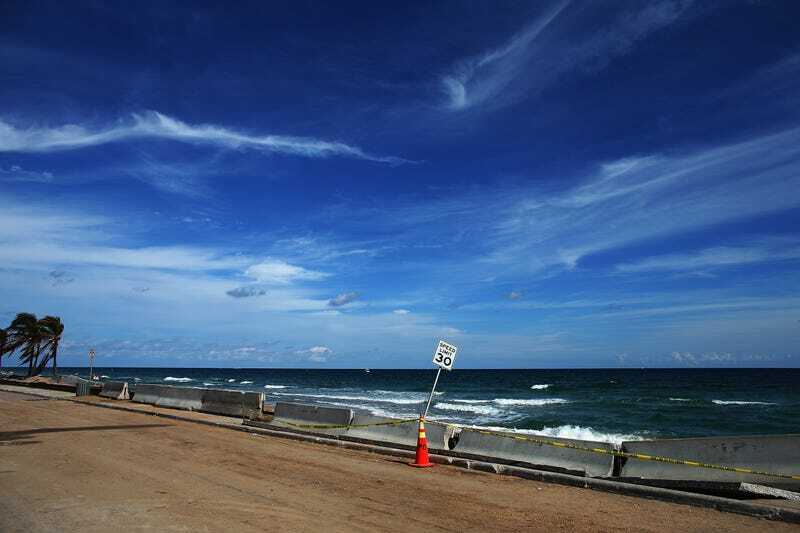 About 75% of South Floridians live on the state’s coastline, and of those, about half live within four feet of the tide line; in the path of rising seas and worsening flooding. South Florida also sits on a foundation of porous limestone, making its groundwater vulnerable to saltwater intrusion as seas rise. Some wells in the region, in fact, have already been contaminated. A study published last month in Science found that Florida is projected to see some of the worst economic damage from climate change — damage that will be felt particularly acutely by the state’s poor. Gwen Graham, a former U.S. representative for Florida and another Democratic contender in the gubernatorial fight, released her campaign’s climate change plan in mid-June. In it, she disparaged President Trump for withdrawing from the Paris Climate Agreement and vowed that, if elected governor, Florida would join the United States Climate Alliance, a group of governors committed to reducing emissions in their states in spite of the federal government’s backtracking. That’s a move that both Gillum — who as mayor of Tallahassee joined 342 other U.S. mayors in committing to uphold the goals of the Paris Agreement, and also attended the U.S. Conference of Mayors in Miami last month, where climate change was a key issue — and Chris King, a businessman and the third-declared Democratic candidate in the race, also pledge to make if elected. “I think most Floridians understand our inter-reliance on a clean environment in this state,” Gillum said. Polling supports that claim: Exit polls from last year’s presidential race showed that two-thirds of Florida voters thought climate change was a serious problem. Graham and Gillum also have plans for Florida’s solar industry. Florida, in addition to feeling the impacts of climate change, has for the past several years faced battles over solar energy. The state has a ban on power purchase agreements — contracts that allow third party companies to build solar systems on residential or corporate properties, and then sell the power produced by the system to the property owner — and has no Renewable Portfolio Standard. Solar activists have fought to make it easier for residents in Florida to install solar, and some progress has been made: the governor signed a bill into law last month that sharply reduced taxes on solar installations. The bill was passed unanimously by the legislature, and Amendment 4, the constitutional amendment that the bill will implement, was lobbied for by pro-solar Floridians and passed with 73% support from voters last year. Still, Graham and the other candidates want to see more done. Graham, whose campaign did not respond to an interview request, has pledged to work to legalize power purchase agreements and implement a renewable energy standard, a policy that requires utilities to get a certain percentage of the power they generate from renewable sources. Gillum also said that a renewable energy standard and power purchase agreements would be “on the table” if he were elected. This summer, Tallahassee broke ground on a 120-acre solar farm, which will provide energy to about 3,400 homes and which Gillum says will triple the amount of solar the city produces. And both candidates have promised to ban fracking in the state if elected, something the city of Tallahassee has already done under Gillum. On the Republican side of the governor’s race, meanwhile, Florida’s current agricultural commissioner Adam Putnam said in May that it should be up to the federal government to address climate change, “so that we don’t put Florida jobs at risk vis a vis other states and other countries.” Putnam’s campaign also did not respond to a request for comment. The Democratic hopefuls’ focus on the environment isn’t a first for Florida: In 2014, Democratic gubernatorial candidate Charlie Crist also pledged to support solar and take steps to address climate change if elected. That race was close — Scott won with 48.2% of the votes to Crist’s 47.1% — and climate change emerged as a key issue among voters. But this election’s environmental element could be indicative of a broader trend of political hopefuls’ embrace of pro-climate and environmental issues after the election of the Trump. In Texas, Democrat Derrick Crowe, a staunch supporter of climate action, is hoping to beat climate denier Lamar Smith in the race for Smith’s U.S. House seat. Smith, who before running worked as a climate organizer in Austin for two years, was inspired to run for office after witnessing the “escalating denialism” in the U.S. political system. Similarly, in California, volcano scientist Jess Phoenix is running to unseat Republican Steve Knight, who has a lifetime environmental voting score of 0% from the League of Conservation Voters. Fellow California scientist Michael Eisen, a geneticist at the University of California Berkeley, announced back in January that he was running for U.S. Senate. There’s been a concerted effort to get more of these pro-science, pro-environment candidates to run for office in the wake of Trump’s victory. 314 Action, a group created in 2016 with the purpose of getting more scientists into public office, is seeking to recruit scientists interested in running and holding training sessions that give scientists a crash course in the election process. The group endorsed a neuroscientist running against staunch climate denier Rep. Dana Rohrabacher last month. And in April, EMILY’S List held a training session for 150 women who were interested in running for office on a pro-environment platform. Gillum and Graham have both criticised Trump’s environmental policies. Gillum said in May that Gov. Scott and Trump have “bur[ied] their heads in the sand when it comes climate change.” And both candidates disagree with the choice to pull the U.S. out of the Paris climate agreement. But even if Florida elects a more environmentally conscious governor next year, Scott’s time in politics may not be over. His term limits as governor don’t prevent him from running for a U.S. Senate position in Florida next year — an option he hasn’t ruled out. He’d be running to unseat Sen. Bill Nelson, a Democrat who has been vocal on combatting sea level rise and who introduced a bill earlier this year to protect federal scientists from any form of “muzzling” or intimidation. So next year’s Senate race in Florida could shape up to be as important for climate action as its governor’s race.